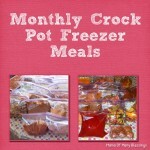 Welcome to our first in depth post of how we monthly freezer crock pot meal planning and cooking series! 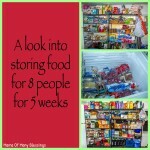 Yesterday I shared an overview of the steps I plan on sharing during this series. The last day of the series I plan on answering your questions, so please comment on any of the posts, on Pinterest on any of the series pins, or over on our Instagram. 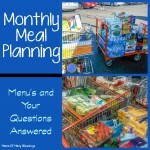 Today I am going to give you an in depth look into what monthly meal planning looks like in our house of 8. 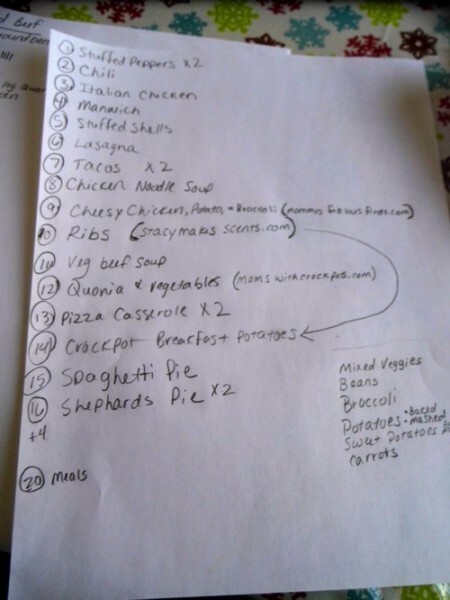 For MANY years now we have meal planned and shopped for a month at a time, it makes things so much easier for us since I do not care to go shopping anymore then I have to! 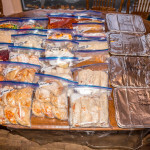 Now that we have started crock pot freezer cooking for a month at a time, things have not changed to much from what they used to be. Well other then us spending less time in the kitchen and having better meals ready to go at dinner time! 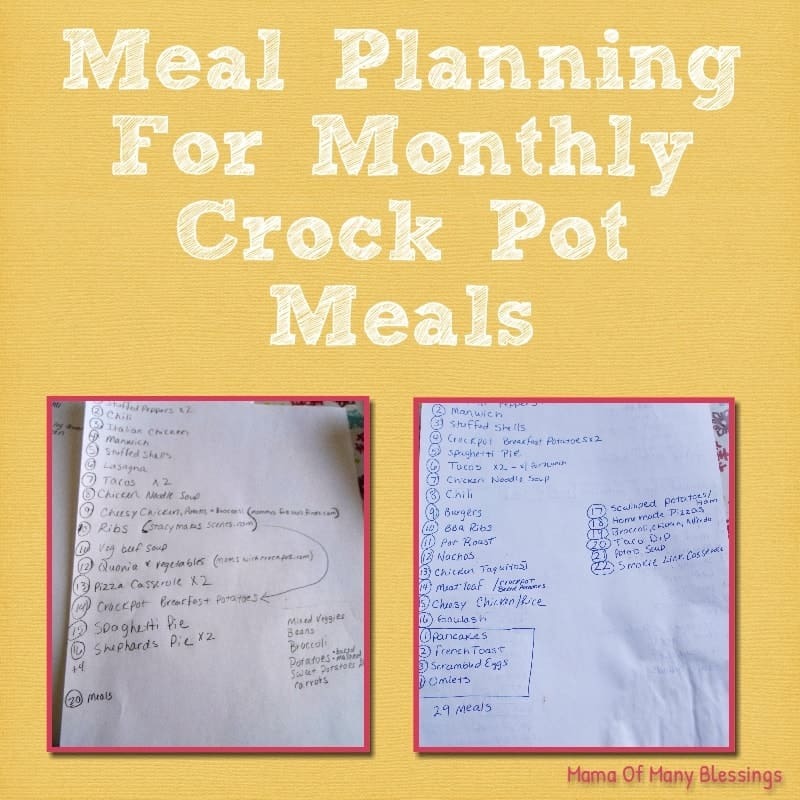 The first month we only made 24 meals, this last month we planned 29 different meals because we really needed more then 24 to get us through the month. 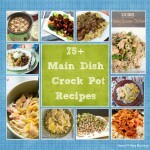 There are a few family favorite meals and those are ones that I will add to our menu 2x’s during the month. 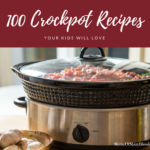 Each month I add the family favorites, but I also try to add a few new meal ideas I have found around the web to our menu to hopefully find new meal ideas everyone loves. 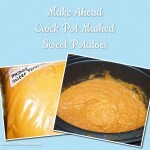 I make sure to print the recipe off as soon as it is added to my list or I might forget where it was found. Here is this months menu with a total of 29 different meals. Any meal that has a x2 after it is made twice. We make breakfast for dinner once a week, and those are separate at the bottom left corner of the page in a box. For anyone wondering where to find the recipes, starting next week I will start sharing some of our recipes that are family favorites for you all to enjoy! Our fruits and veggie choices for this month are on the lunch page which is just on the other side of this menu (shown below). 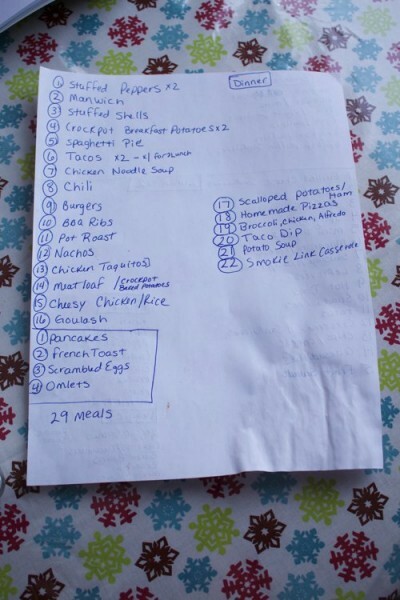 This was the first months menu, because this month we also made breakfast for dinner once a week as well, we really had a total of 24 different meals and not 20 like the sheet says. Our veggies options are in the bottom right corner of this menu. 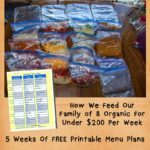 On top of planning our dinner meals, I also come up with 15 different lunch ideas that are made twice through out the month. 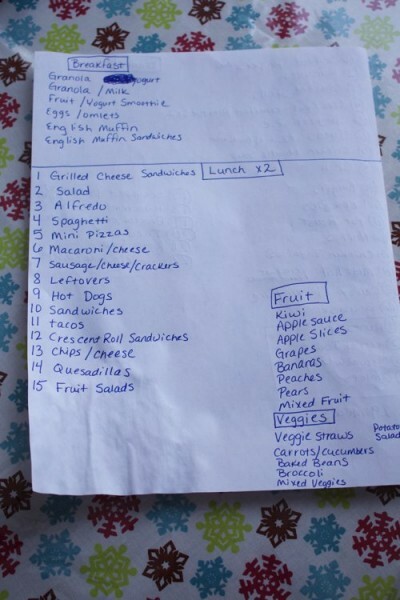 Most of the lunch ideas are repeated monthly because most everyone likes the meals which is not easy with 6 different kids. 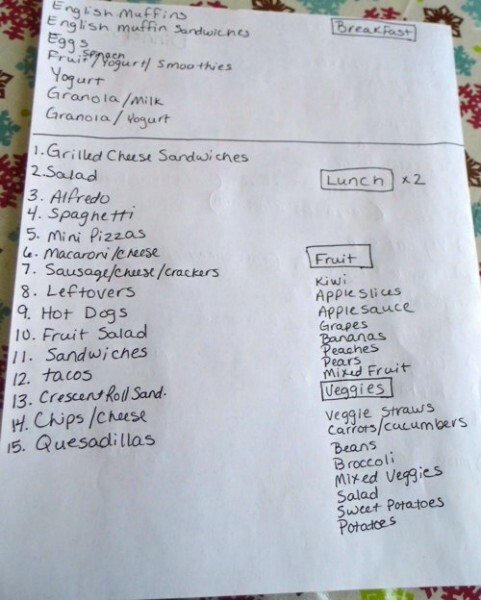 I list off different breakfast foods that will be available for the month as well, we have the same breakfast food every month. You can see this month and last month below this one I listed the fruits and veggies (there are a few missing, however) in the bottom right corner. These are fruits and veggies for both lunches and dinners. You will notice that everything on the breakfast, lunch, fruits, and veggies menu is the same. Things stay like this through the beginning of spring when we get fruits and veggies in season from the farmers market. It’s as simple as that, be sure to stop back tomorrow for a look at how I get all of the recipes into a shopping list and to get a look into what shopping for a month for a family of our size looks like. Please leave your questions in the comment section below. Later in the week I have a post going up answering all you’re questions. 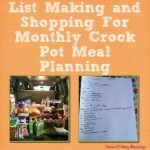 I am linking up with these great link parties, stop over for other great ideas. I haven’t thought of that before. I guess I figured everyone has their own taste and would necessarily like the things we eat around here. I will have to work on putting the lists together in a document so that people can download and print them and see if it is useful to others as well. 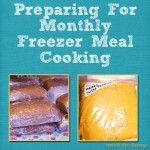 Thank you so much for the idea, it’s people like you that often give me the best ideas for the blog!! I hope you have a spectacular weekend.